Unfortunately only his irons are matched. The rest of his clubs can easily be matched by the BioMatch method so that he can use the same swing for all his clubs, without altering the length of the clubs or the weight of the club heads. The optimum weight of each club is obtained by inserting the appropriate size of weight into the grip end of the club. This saddening news for many came just three days after he committed to playing in the Safeway Open and three days before the open is setting to take place. Speaking earlier Monday on Golf Channel, Notah Begay III said that Woods had "some concerns about the sharpness of his game" after sitting out the past 14 months. “He just didn’t feel like his game is where he wanted it to be to be competitive," Begay said. It looks like the wait for Tiger to return to golf will continue to be highly anticipated. Tiger Woods announced on Friday, October 7, 2016 that he will be returning to the PGA Tour. Woods will participate in the Safeway Open, which begins October 13th. In a website update, he states that he hopes to play in the European Tour’s Turkish Airlines Open, held November 3-6. As well as the Hero World Challenge held December 1-4. This is all dependent on his physical recovery. After his las competitive play at the Wyndham Championship, in 2015, Woods underwent two back surgeries. At his appearance at the Ryder Cup last week, Woods gave no indication of his intentions to play, nor the condition of his health. However, his play of the course showed him to be ready for a return. Before teeing up at the Safeway Open, Woods will participate in the Tiger Woods Invitational, held October 10-11 on the Monterey Peninsula. From there he will kick-start a return to golf that everyone has anxiously been waiting for since over a year ago! The 41st Ryder Cup more than lived up to expectations as the United States on Sunday clinched its first crown since 2008, winning Sunday singles 7.5-4.5 to capture the cup by a 17-11 margin. The United States is now home to the Ryder Cup for the first time since 2008, and Davis Love III improves to 1-1 as the American captain, getting revenge for the 2012 collapse at Medinah. Here are the individual records for each player on both teams. After a dominant performance in morning session foursomes in which the United States swept Europe 4-0, the Americans saw their lead cut to 5-3 following a tremendous showing from the Europeans in the afternoon four-ball matches. To be successful in a game as difficult as golf, you need to practice. Very few people can head out for a round and post a good score without working on their game beforehand. Practicing at a driving range is a perfect way to get better, but there are some things to remember. You need to follow the rules and be courteous of the facility and others joining you on the range. Some driving ranges require that you hit from a mat, while others allow you to hit off the grass. It is very important to follow the rules. Stay within the boundaries. Hit each ball close to where you hit the last one to minimize damage. Be aware of your surroundings. Stay far away from others to minimize the risk of hitting anyone. Before you swing, look around to make sure that nobody is behind you or walking by. Never walk out on the range to retrieve balls. Remember that you are sharing the range with others. Keep the noise level down and remember to keep your cell phone set to vibrate. Avoid sudden movements around a player who is about to swing. Most driving range facilities also offer putting greens and short-game areas for people wanting to work on chipping and putting. Treat these areas as you would a green on the golf course. Do not chip on to the greens from the driving range. By keeping these tips in mind regarding etiquette at the driving range, you will ensure that you and all other golfers will have a pleasant experience. The Ryder Cup has become one of the world’s greatest sporting events. It’s Team USA vs. Team Europe, as 24 of the world’s best golfers play for pride, patriotism, and the most coveted cup in golf. The competition is every two years with the venue alternating between courses in the US and Europe. A three-day competition that includes head to head match play, the team that gets to 14 out of 28 available points will take home the Ryder Cup. Don’t miss a moment, September 30 to October 2, only on Golf Channel and NBC, as Team USA fights to reclaim the cup at home. Golf Channel will be there from the beginning, live from Hazeltine National Golf Club, in Chaska, Minnesota. Do you Slice your Driver? Most golfers have a problem slicing their Driver, but not the other clubs. This would, of course, not happen if all the clubs were matched. In a matched set of clubs, all the clubs will go straight, as long as you can hit any one club straight. So why does the Driver slice? Because the moment of inertia of the Driver is too large compared to its overall weight. This causes the hands to be too far forward at impact. In other words, you are hitting the ball with an open face. As your hands are too far forward at impact position they are now on a path towards the left, away from the ball, causing a slice spin. The large moment of inertia of the modern Driver is mainly caused by the increased length of the Driver. In an attempt by golf club manufacturers to produce more distance, they have increased the length of the Driver. This may work for you if you are able to steer the club with your wrists into a position where you can control the ball flight. Steering should not be necessary. It complicates the game as you have to steer each club differently, as they are not matched. 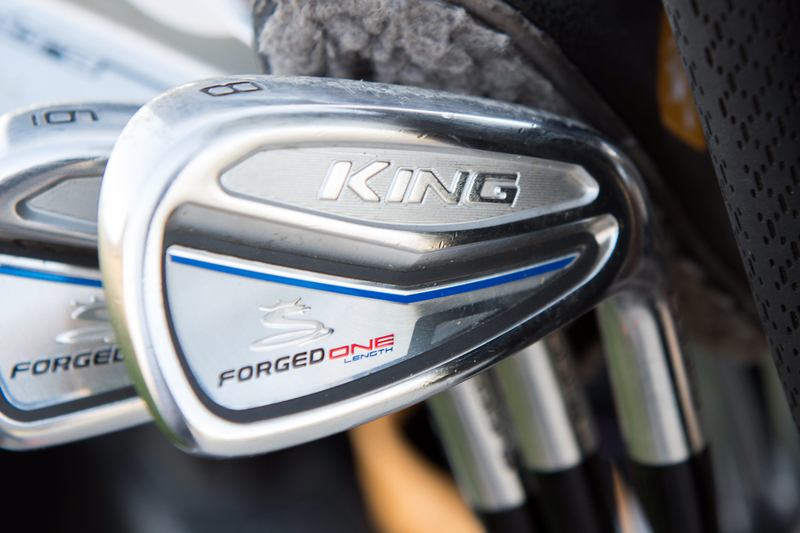 If your clubs are properly matched they should all behave as intended with relaxed wrists. Relaxed wrists will also provide more distance. Golf club manufacturers are fighting the open face by manufacturing Drivers with a closed face. However, the slice spin remains as your hands are moving right to left at impact. Some club manufacturers try to further reduce the slice by adding movable dead weight to the club heads. The dead weight further increases the moment of inertia of the club which again will add to the problem. When moving the weights around on the clubhead the center of gravity of the clubhead is no longer aligned with the geometric sweet spot, causing further problems. This all adds up to a very unstable condition. It is like trying to balance a ball on top of another ball. When adding weight to the grip end of the club, your hands will slow down slightly. And due to the added weight, you body will create more kinetic energy. This added kinetic energy translates to added club head speed. Meaning that your club will release faster making your club head catch up with your hands. The BioMatch method of matching golf clubs calculates the exact weight to be added to each of your clubs for the club head to catch up with your hands exactly at the point of impact. The BioMatch method calculates the specific weight to be added to the grip end of all your clubs. The BioMatch system is available online at www.rational-golf.com. The weights that are specified in the BioMatch Report can be ordered by a click of a button. The weights are easily installed with the accompanying tool. It is a lot easier to learn and maintain one swing rather than 13. 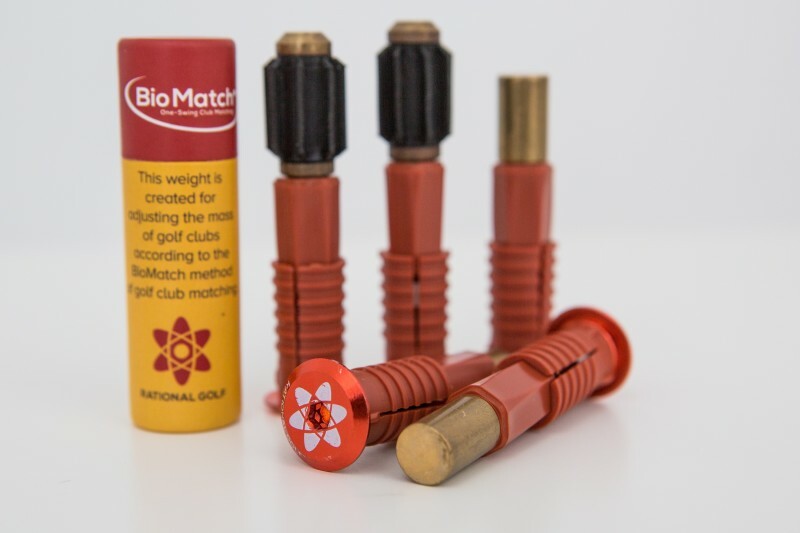 BioMatch does magic to any golfer´s game. The force F, acting downwards at the grip end of the club. This is the force measured by the Swingweight instrument. The force G is the gravitational force acting on the golf club. It is simply the weight of the golf club acting at its center of gravity. The location of the center of gravity can be determined by balancing the club on a knife-edge. The center of gravity is located at distance BC from the fulcrum. The third force is acting upward at the fulcrum. 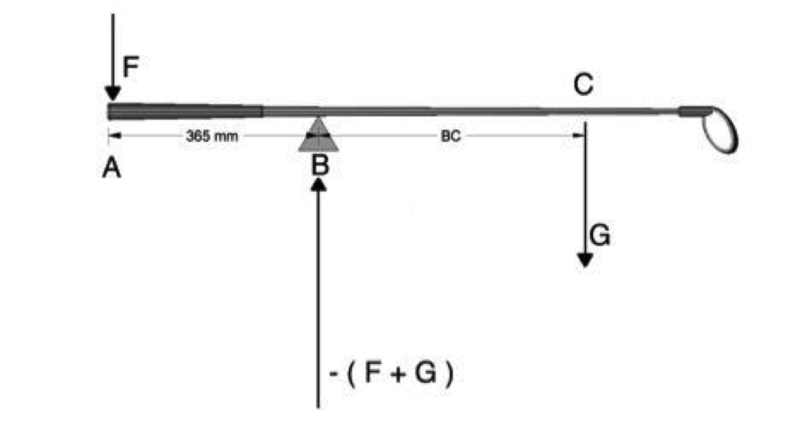 The fulcrum is located 356 mm (14 inches) from the grip end of the club. This force equals the sum of force G and force F, acting in the opposite direction. From a table that I will forward next, you can look up this number and see the Swingweight. Swingweight Table From the table, the calculated force corresponds to a Swingweight of D7.8. Measuring the club in a Digital Swingweight Scale gives the same Swingweight of D7.8. The club used for this example is a TaylorMade 5 hybrid. The fact that a letter scale and a measuring tape can replace the Swingweight Scale, which has been utilized for almost a century, will come as a big surprise to the majority of golf club fitters. This ought to raise some concerns even for the die-hard Swingweight supporters. As the center of gravity does not enter any equations describing circular motion, the Swingweight of a body cannot be related to how a body acts under circular motion. Newton’s second law of circular motion states: Torque = Moment of Inertia x Angular Acceleration. There is, therefore, no relationship between Swingweight and how a golf club behaves when acted upon by a golfer. Ever since the Swingweight principle was developed in the 1920s, it has been the accepted method for matching clubs within a set, so they all feel alike when swung. 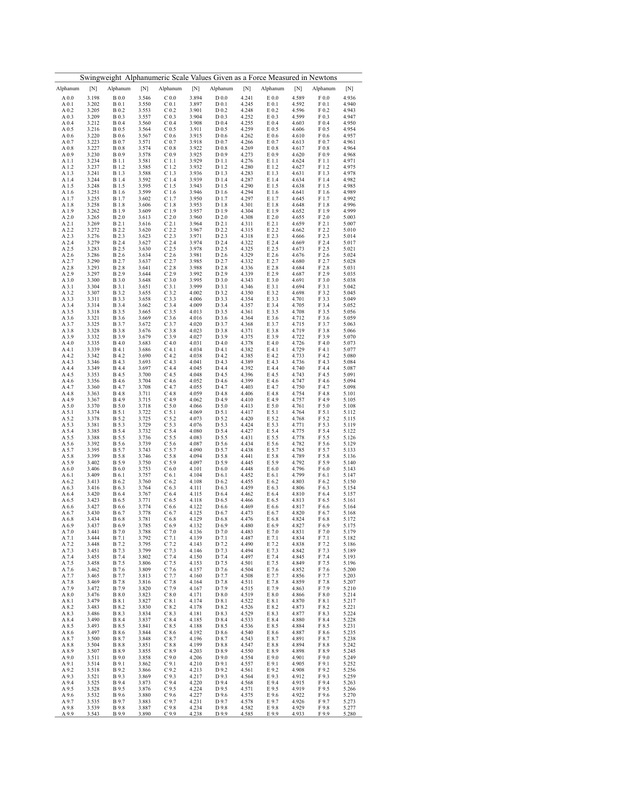 In short, it is a measurement of the weight distribution of the club. And with the introduction of lighter shafts, grips, and club heads, the possibility of a wider range of Swingweights, and thus more inconsistency from club to club is greater. When Robert Adams was matching his set of golf clubs by waggling the golf clubs in a horizontal plane, he was in fact attempting to measure the moment of inertia of the club around the center of the grip. The moment of inertia around the center of the grip is henceforth referred to as MOIG. One can imagine how difficult it would be to adjust all 13 clubs until they all felt like having the same MOIG. There were no instruments available for measuring the moment of inertia at the time. Robert Adams made an instrument that would provide an indication of whether all the clubs in a set of golf clubs would have similar MOIG. The clubs used to develop the swingweight method all had similar wooden shafts. That is no longer the case. The Swingweight system is therefore even less useful today than it was 90 years ago.